After great success from last year, Bowls BC will be holding the 2017 Vancouver Island Indoor Qualifier once again at the Qualicum Beach Indoor facility Women: March 3 – 5th, 2017 and the Men: March 10-12th, 2017. 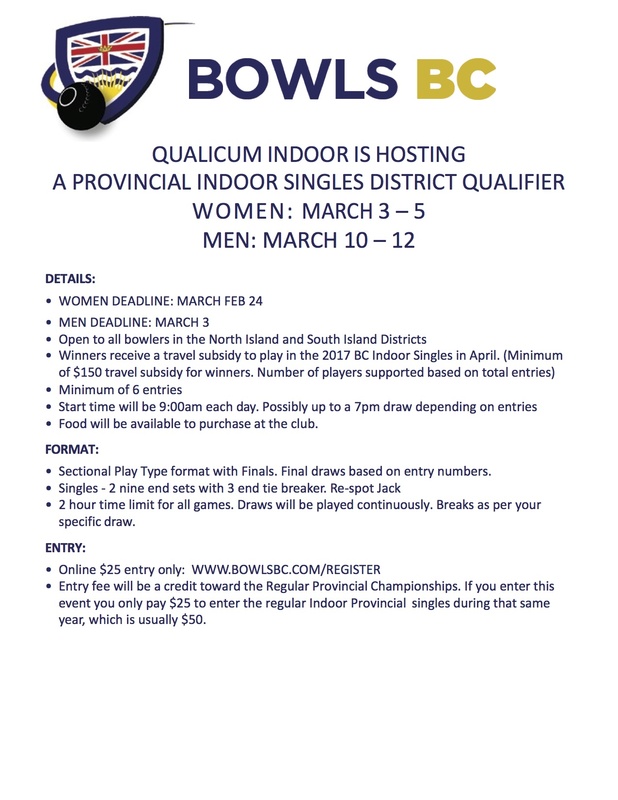 This is your chance to play against some of the best Bowlers on the Island, along with the opportunity to prepare for the up coming BC Indoor Championships being held at the PIBC in April. This tournament is open to all members of the Island Districts. Please head to www.bowlsbc.com/register and pick “Indoor Qualifier – Qualicum – $25” from the drop down menu to enter the tournament. Entry deadline is Feb 24, 2016. *You do not need to be a member of the Qualicum Indoor Facility to be eligible to play in the Qualifier, this is an open event. • Visit to the head after delivery of third bowl only. Limit of 2 minutes per visit to the head. • Sectional format of play with finals. • All other conditions of play will follow the general Bowls BC conditions of play for the indoor singles championships. • The provincial Championships is remaining open to all bowlers, so if you enter this event and do not win, you are able to also enter the BC Championships for the specific event. • Minimum $150 for 1st place winner to participate in the BC Indoor Singles Championships.